Peter the Great founded St Petersburg in 1703 and moved his capital there in 1712, where it remained until transferred back to Moscow on 3 March 1918. Its name changed to Petrograd in 1914, and to Leningrad in 1924, and reverted to St Petersburg in 1991. 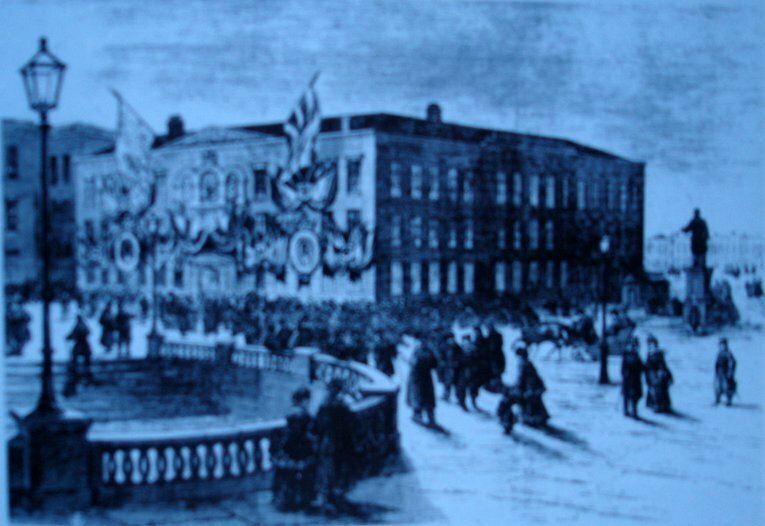 Since at least 1865, successive ambassadors had leased for their embassy a huge apartment in a palace, dating from 1788, that overlooked the Neva in the first district of the Admiralty quarter. The apartment comprised the whole of the principal (first) floor, with some bedrooms on the floor above and the chancery on the mezzanine level below. The palace’s owner was Prince Soltykoff, a member of the old Russian nobility, who lived with his family in lesser areas of the same building. A ten-year renewal of the lease from 1873 had recently been signed when the Office of Works first became involved with St Petersburg in 1875. It appears to have renegotiated the 1873 lease to run from 1875 provided that Soltykoff put aspects of the house into proper order, which he partially did. Robert Boyce, the Office’s principal architect and surveyor for diplomatic buildings, visited St Petersburg in February 1879, just as Lord Dufferin was arriving as ambassador, and found that the State rooms needed a thorough refurbishment, likely to cost up to £6,000; that the furniture was scant and worn; and that the chancery needed new furniture. Boyce proposed that Soltykoff should do these refurbishments at his own cost in return for the Office of Works entering into a new 14-year lease. It transpired that Soltykoff was not in a position to implement this arrangement. The Treasury instead agreed to authorise a maximum of £8,000 for the work to the State rooms. A Mr Arthur of 18 Motcomb Street, Belgrave Square, London, won the consequent tender and did the work without ado. The 14-year lease was eventually signed on 30 September 1879, thus due to expire in September 1893. In 1892, Soltykoff warned that he wanted to increase the rent from 15,000 roubles to 18,000 roubles per annum. The Office of Works found this acceptable and the next lease ran for twelve years to March 1906. By the time that Rivers visited again, in 1903, the new prince offered to renew the embassy lease for another 12 years, with a 12 year extension. It is not clear whether the sanitary arrangements had been improved by then but, despite the widowed princess’s tiresome interventions, a new lease was eventually signed in August 1904 for 12 years at 25,000 roubles per annum, extensible for a further 12 years. In the subsequent 1916 negotiation, the lease was only extended eight years, to December 1924. Olin was released on 31 October 1918, and must have remained with the embassy in some capacity until he moved to Riga in July 1922 because he later outlined some of the few events at the building during that four year period. The Dutch mission sealed all the safes and kept the premises as unvisited as they could until they and other neutral legations were attacked and they had to depart in June 1919. It is likely that the British plate was still stored at the Dutch legation and was stolen at that time. A Mr Kimens of the British Red Cross, who were still based in the embassy, left in October 1919, after which an Expert Commission (elsewhere referred to as the Bolshevik Antiquarian Committee) was asked to occupy the building to keep, as far as possible, its contents safe. It was forced out in March 1920 by the Foreign Affairs Commissariat, whose agents removed all the seals and helped themselves to typewriters, effects and clothing and, in slower time, forced the safes, stole their contents, and removed books and trunks belonging to the ambassador: soldiers cut the leather form the furniture. Moscow ordered the robbery to cease in March 1921, although three motor cars were subsequently removed. The building was ostensibly guarded day and night from the autumn of 1921. The Office of Works continued to pay rent for the apartment to the Soltykoffs until the expiry of the lease in December 1924, mainly to ensure, it hoped, that the furniture and belongings left in the building would be protected. The old Prince’s widow died in April 1921. The Soltykoff family, knowing that it would lose the house on the day that the British government ceased to lease a major part of it, tried in vain to persuade the Office of Works to buy the house, or at least to extend the lease for another year. Foreign Office minuting commented that ‘If we could share his [Prince Soltykoff’s] opinion that that Govt will collapse within the next 12 months we might consider his proposal’. The outcome was that the rent payments ceased at the end of 1924. Meanwhile, diplomatic relations between Britain and the Soviet Union, whose capital was once again Moscow, had been established in February 1924. In July 1925, the Soviets agreed to a British team entering the St Petersburg house to dispose of its contents and to return private property to its owners, although they had by then been compensated for their losses. The Foreign Office invited bids from nearby Posts for the furniture. Oswald Rayner, billed as a temporary clerk at the Foreign Office but in reality a senior MI6 officer and FJ Rutherford, from the supplies division of the Office of Works, were allowed into the house on 1 October 1925. The conditions they found were appalling: the building had not been heated or ventilated for over six years, and deep flooding in September 1924 had never been drained. Stench, fungi, chill and chaos were everywhere. It took the team eight weeks to sort everything out. In all, £12,000 worth of goods were recovered, packed and dispatched. Earle congratulated the pair ‘for the expedition and management of this odious duty under most trying circumstances’. 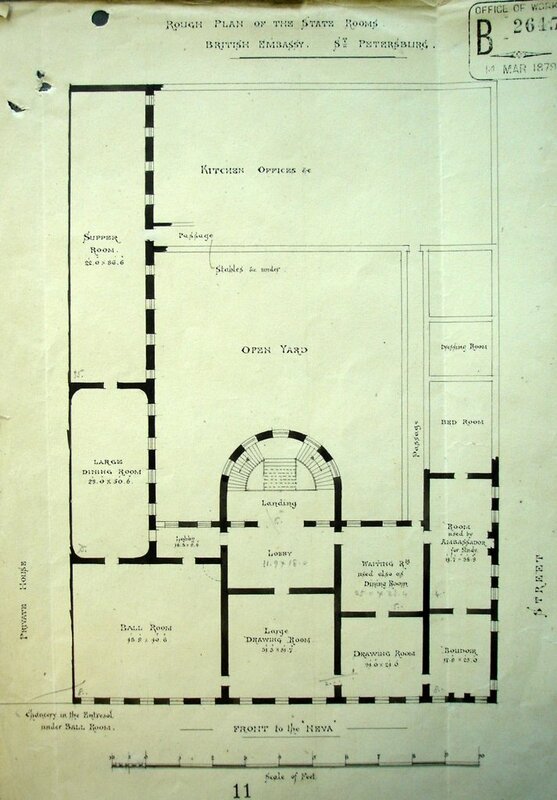 1879 plan of State and major rooms on the first floor of the Soltykoff Palace. The thawing of the Cold War opened the way to the establishment of a permanent new British presence in St Petersburg. A search for a suitable property soon started, and a lease was signed in 1992 on a handsome block, formerly occupied by a music school, in the central district. It was larger than essential, but was refurbished by OED/FCO and converted to offices and [??] several flats. [more detail required, and present position?] A freehold block was acquired in ??? 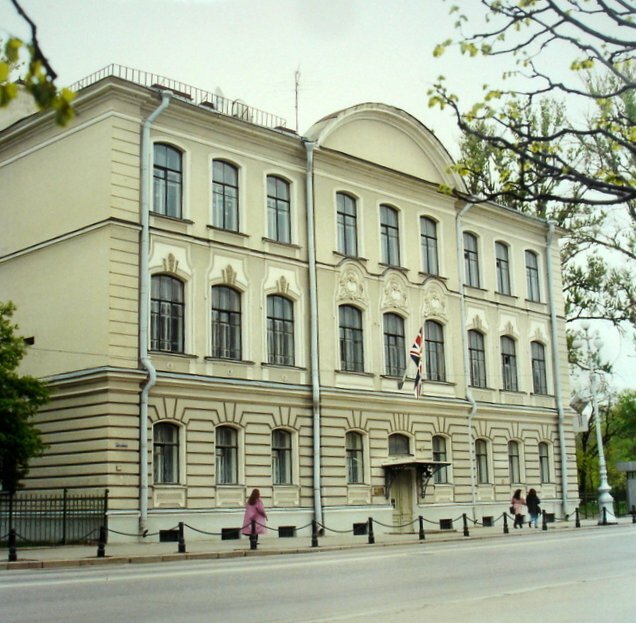 at Kovenski Pereulok 21: the upper floors were converted to apartments for the consul-general and four other staff, and the lower two floors sold to the United States consulate.